Clean Break are experts when it comes to drain cleaning and drain jetting for both domestic and commercial properties, sewers and road gullies. Whether it is a one off call out to unblock a 4 inch house drain or a regular cleaning contract for a large industrial estate, Clean Break are kitted out for the job. Drains can block for a number of reason, the main being foreign objects being placed down a drain that shouldn't be there - anything from waste paper to concrete sediment- but others include build up of silts, grease, fats and sometimes structural defects where tiles move or tree roots grow in the drain itself. We have a range of nozzles that are suitable for different types of blockages. 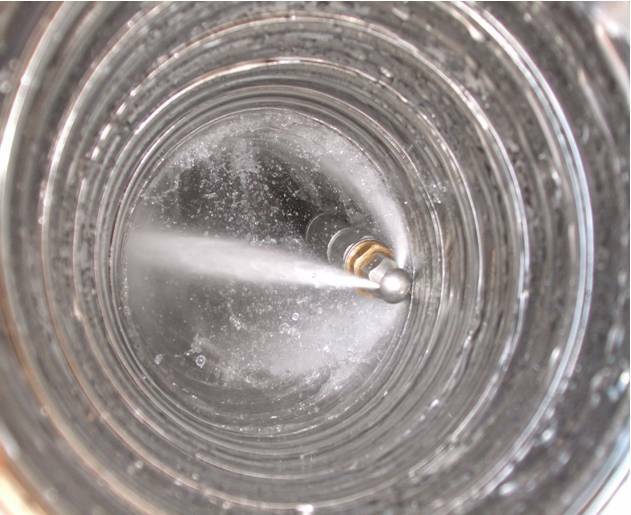 We use special forward facing nozzle for the most stubborn blockages and high speed rotating nozzles for cleaning drains. When fats, oils and grease are the problem we have the ability to use saturated steam which is produced by our 500 bar diesel powered steam cleaners. These can produce a heating capacity of 198kw and can take up to 30 litres of cold water a minute at a pressure of 7300psi up to a temperature of 98°C a the end of the nozzle. With this kit we are capable of dissolving all traces of the problem source and leave your drain like new.